Crazy fun Frazzle. 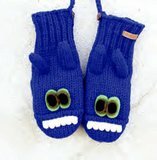 Great Frazzle mittens will keep you toasty. Who wouldn't want to keep warm and party with Frazzle?! Made of 100% natural wool from New Zealand. These contain lanolin which makes them water resistant and gives them a natural self cleaning effect. Cozy fleece lining throughout.